Spokane Tree Pro is a family-owned tree service operating in the Spokane Metro area, including Spokane Valley, Liberty Lake, Five Mile, Seven Mile, Nine Mile, North Spokane, Mead, and the South Hill. We can handle many tree services, including tree removal, dangerous tree removal, tree pruning, stump removal, tree planting, and logging. And, we have the specialized equipment, insurance, and licenses to handle your tree services. Get in touch with us today to start your no-cost estimate. We’re looking forward to hearing from you! Spokane Tree Pro is a family-owned and operated tree removal service. More than a Spokane tree service company — we consider ourselves urban foresters. 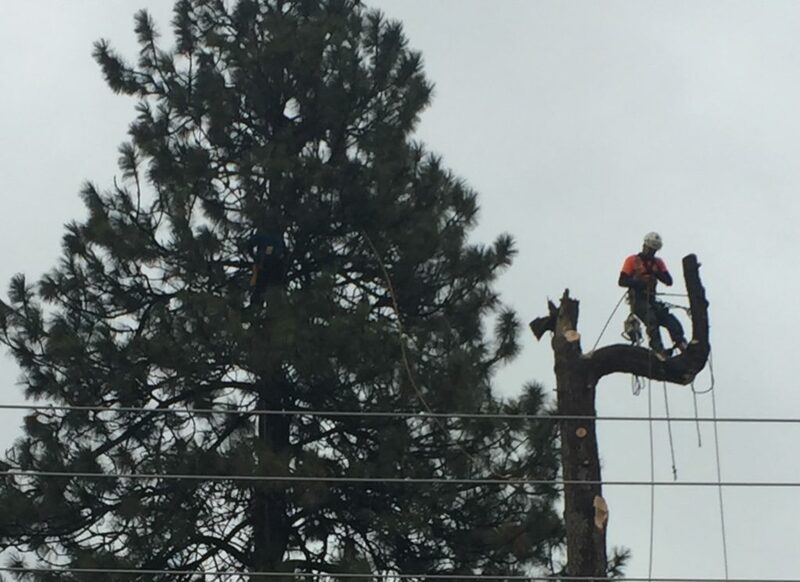 The Spokane area can present many challenges when it comes to tree pruning and tree removal. Whether it’s the size or health of the tree, the terrain and surrounding structures, or the weather, we have the capacity and equipment to work safely, efficiently, and to your satisfaction. When you choose Spokane Tree Pro, we are committed to treating you like part of our family. Our neighbors had Spokane Tree Pro remove 9 trees from their yard. As I watched them work I was simply impressed how efficient and professional they appeared. They were truly a well oiled machine so I asked for an estimate on our trees and hired them on the spot. Ben, the owner, is a very friendly, up front guy. A local boy (Shadle) who started the business from scratch. A very impressive company. And they DON'T leave a mess! We had a Birch tree that was dying and had to be taken down. After researching different companies and meeting with several, we decided on Spokane Tree Pro. We could not be more happy with the results, they were professional, efficient, friendly and very easy to work with. We will definitely be using them again for any future tree removals. We highly recommend them. I had a tree fall on my tahoe this morning & I called Spokane Tree Pro & talked to Maria who was very friendly & she got Ben & his team to my place very quickly on short notice. Ben & his team had it all cleaned up by 1:30! Their whole team did a great job & I was very happy with their service & I would definitely recommend them! Maria was very friendly and informative as we set up the job. The crew was fast and efficient - and they worked very safely. Great job cleaning up the site after the trees came down. Tree Pro was not only more reasonable by far of other bids for my tangled mess of a sloping back yard but friendly and extremely helpful. They follow instructions and go the extra mile. I asked for their cards to pass on to friends with wooded lots. It's rare to find a company that offers great service, quality work, a fair price - AND - they have a staff of 'great people'. We've worked with other local tree companies in the past, and while they may offer the same services, this family owned business does it with personal touch that is second-to-none. Thrilled with the outcome. We'll surely refer STP to others. With this machine, we are able to access hard to reach and challenging trees safely and effectively. Get seasonal reminders and discounts!